If you are a bride looking for an affordable and talented wedding photographer, please check our Pricing Page. This article was written for photographers and you are more than welcome to read it. Toronto wedding photography is in a downward spiral. As there is no governing body or guild license needed, like in countries such Austria, plenty of "amateur photographers" entering the market and profit margins are shrinking faster than ever. Brides’ discussion groups abound in questions on how to find an affordable, budget friendly or student wedding photographer under $2000. When it comes to wedding albums, one of the products with high margins in the past, very few couples even care about them. 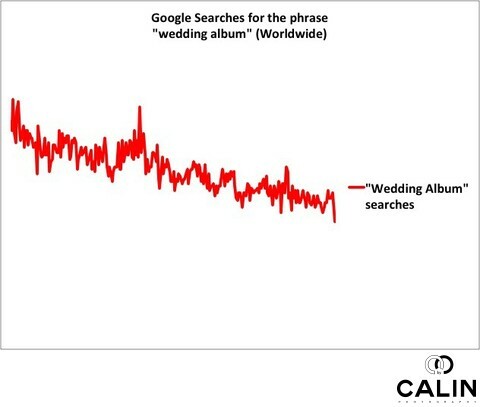 The chart below shows the dramatic decline of the printed wedding albums in the last 14 years. What do we do in this tough environment? Here are some tips from a Toronto professional photographer on how to survive and prosper in this competitive marketplace. Many of us start a new career and strive to offer affordable wedding photography, and do not consider the business impact of that. Many websites like CreativeLive, IceSociety, etc., lure you with the promise of huge money and a dream life, but there is little info for the newbie. The above mentioned sources have little on pricing in your first years of business. Are you kidding me? There are professional photographers who charge $10,000 per day, but that is after decades. At that price, you need to shoot only 20 special. Well, they shoot well, but we took that amazing image of our dog and it got 300+ likes. We all know that guy who started two years ago and is now he is doing destination wedding photography in Bali, Santorini, Rome, etc. Truth be told, we see photos taken at luxurious resorts or venues, but we actually don’t know how successful that destination wedding photographer is. Shooting high budget events is useless if the couple does not appreciate photography and, therefore have a low photography budget. On the other hand, I had clients with a small budget, but who were so in love with photography that spent the vast majority of money - relative to the cost of their special day - on photography. I remember my second shooter, a good friend or mine, saying with admiration on the wedding day: wow, this is such a small event yet they spent most money on photography. Documenting a backyard marriage at my listed price? My absolute dream clients!!! That winery wedding where the bride wants you to shoot for free (and include a photo booth) because it will look good on portfolio? Not my client! With such a high influx of wedding photographers, how is the demand part of the equation? After all, that drives equilibrium prices. If I remember well my Economy 101, the equilibrium price is a result of supply and demand. I analyzed Google searches for our services and they are dropping at an alarming rate. Many brides on budget hire a friend to take some snaps on their big day and ask their guests to crowdsource the shots taken on the wedding day through apps such as Ceremony. Can you imagine if that trend becomes mainstream? How will you, the affordable wedding photographer survive? If you are serving the low end sector of the market, you will be replaced by guests with iPhones, which, we know can take damn good photographs these days. On the wedding day, I already see ceremony photos posted on Instagram seconds after we left city hall. During the special day everyone turns into a professional photographer. The bride’s mom is fighting my wedding video guy for the best spot to capture it all with her 0.9 megapixel tablet. By the way, the bride’s mom always wins. Long story short, the demand for photography is dropping, but not the demand for good photography. The luxury clients will never hire an affordable wedding photographer. They will go with the best professional money can buy. After all, peace of mind is important on your big day. In the bottom part of the market, life is tough with shrinking demand coupled with an ever-increasing number of photographers. With the digital revolution in cameras, and that will only accelerate, the low end or budget wedding photographers will be extinct. A whole segment of the market is constantly churning. New photographers enter the industry, last for one or two years, burn out or go out of business, only to be replaced by a new wave of photographers. It’s the circle of photography life. I get it! If you are new, you have to start charging a low price for your services…that’s what everyone does there is no shame in that. It goes back to the same equation. When demand for your services is zero, your price is … you guessed…zero or close to it. If you have no portfolio and want to start shooting marriages you will book clients with extremely low budgets…if you are lucky. In the first year, your wedding packages look like an all you can eat menu. You include engagement sessions, I, all wedding pictures and an online gallery. Heck, I even offered my first bride and grooms free wedding albums and a photo booth, besides the customary engagement session and portrait photography. I was so cheap that the bride and groom made me their family photographer, so every year I take family portraits of them. We all have to start somewhere. I admit it! I shot my 10 marriages for free and I am not ashamed about it. It is unfair to the client to pay for a service where I had no experience. Even more, I offered to photograph local and destination weddings for free and nobody wanted to book me. It makes perfect sense…why would a bride gamble her special day moments for the sake of getting a good deal. Honestly, my skills were not worth much in the beginning, but I studied every day for fourteen hours, improved my craft and got lucky! One of my free special events and an engagement photo session were published by industry blogs. I got a few national awards, which gave me credibility and I started booking clients with larger budgets along with cheap marriages. When I started my journey offering the lowest prices in Toronto, I thought I will attract a lot of clients clients. Wrong. I was booking just a few clients, just at a lower rate. Promos and discounts do not increase the number of events booked…actually, the other way around. In several industries such as perfumes, wines and photography…dropping prices is an indication of low quality and nobody buys. I had more clients who told me they booked a more expensive photographer than I had clients who told me I was too expensive. Few brides risk their wedding pictures for a few hundred bucks and if they do, they are not your clients (please read the target market section). Even now being a budget-friendly photographer a few years ago is hurting my business. Referrals from the low end clients are not booking me years later expecting the same wedding packages. Keep in mind that if a bride paid a certain amount, she broadcasts that number online or through the word of mouth and you will be asked to offer the same affordable price. Photographing a low budget reception involves a lot of work. Why? The venue looks bad, the decorations are low budget, the flowers look cheap. Everything screams cheap and in order to make that venue look good, you need a miracle. On the other hand, an upscale bride who plans a destination wedding in Tuscany has the budget for a splendid venue, which is easy to photograph. The bride and groom want three wedding albums and a multi day engagement session in Iceland and Maldives. The couple never bargained as they love your work and know talent is rare. Now, which client do you want? Don’t get me wrong! I want to shoot a lot, but at a reasonable price. Our costs are rising across the board, from the cost of living to the costs to operate a business. Last time I checked, the Canadian dollar was crushed by the greenback. As our equipment and workshops are sold in US dollars, my friends, we are seeing our profit margins shrinking in real terms if we don’t pass the cost increases to our clients to preserve our profit margins. We just don’t see it because we are artists and cannot be bothered with budgeting, forecasting and margin analysis. You spend a day doing an engagement photo shoot and a few hours building an online gallery, but charge such a low price you will not even get referrals after that. Why? Your clients are ashamed to admit they hired such a bargain wedding photographer. To stay in business and avoid being stuck in this low profitability segment of the market, you need to abandon these rock bottom prices fast to a more sustainable level where you can operate with some sort of financial success. If you stay for too long at the bottom at the market, you will be positioned as the cheap photographer. That will make it more difficult for you to move to become profitable, because you are labeled as the affordable wedding photographer. As your customer base increases, former brides, whom you served impeccably, will start referring you their friends and soon the majority of your business will come through referrals. The problem will be that, unfortunately, you will not want all the low budget clients, but will have little choice, as you need to stay in business. You will burn out and hate your life. I talk with many photographers and raising prices terrifies them. Still, last time I checked everyone was doing it, but somehow we, photographers are nice people who cannot do that. Nonsense. You will not survive if you are not profitable. Let’s start the journey of raising prices together. Keep reading. I know my client. She is the bride with a wedding budget of $30-40,000, lives in Toronto or GTA, getting married the first time, loves photography in general and my work in particular and has the budget to hire me. Period. Define your target market and focus on it. Rich people like high quality delivered conveniently and timely to them. In other words, they want great service, and speed. Bargaining for is not in their DNA. They also want peace of mind on their big day and if your packages are too low, that will make you undesirable. You currently shoot cheap weddings and that is ok. That pays the bills. Still, shoot that inexpensive wedding like it is a most opulent wedding ever. Use shallow depth of field to make the reception look lavish. Learn posing, lighting and improve your post processing skills and your work will look awesome. You need to find your own style and be different from all the others. If you are not unique, you are a commodity and price becomes the only differentiator. When you start competing on price, you are doomed. There is always someone who can undercut you, as his or her cost structure is better. This goes back to your target market. Who is your target market, the segment of homogenous people to whom you can offer amazing value? I am not talking about price. I am talking about your unique selling proposition. The value of your services should be so high, that hiring you is a no brainer. IF you cannot find a niche, define it! Check out the tattooed bride.com. This guy defined his own niche. His bride is the tattooed bride and he owns that niche. No major studio can compete with him on the niche and he is practically in a monopolistic position. If you live in Toronto, you are familiar with LCBO. They are a state owned monopoly and the profit margins are outrageous when for a monopoly in any industry. You are shooting cheap events because you get no inquiries. That is unfortunate and you need to improve your marketing. Improve SEO, advertising, social media presence so you become more visible to your target market. Have some awards under your belt. That screams quality to clients who have the budget to afford a good photographer. If your work is good and is accompanied by good customer service, you will move from the bottom of the pyramid. Having a wedding published is hard. First, your photography needs to be outstanding and you need a certain style to match the editorial style of the blog. Style me pretty receive 500 submissions a week and it is really hard being published. That is the reason why appearing on blogs makes your work look more valuable and drives traffic to you, besides the SEO value of inbound links. A rich bride can smell an inexpensive dress from a mile and will not book you if your portfolio features such dresses. A way to get out of that is to shoot for an established photographer to learn and to be able to use the pictures you took. That wedding reception that looks like a million dollars will bring you similar ones. Make sure you are allowed to use the images. Now that you defined your target market, you need to focus on it. Still, your former couples will send you clients who do not have the budget to hire the "new and improved you". Even when you get referrals from low budget brides, respectfully decline them. I repeat, if they cannot afford your packages, do not offer discounts to book them. It will cheapen your work; you will redefine your target market, upset your other clients (the ones who pay full price) and confuse the market. Are you a cheap photographer or not? What is your advertising budget as a percent of total revenue? What is your profit margin? Know your conversion ratios in your sales funnel. STOP! What? Ok, let me step back. Knowing those ratios you will see where you have a problem over time. Is it in generating visitors? If that is the case, you need to step up your advertising efforts to attract more visitors to your client. On the other hand, if your Booking ratio is low, you need to invest in sales. The beauty of mastering sales is that you can reduce your advertising budget by simply becoming a better salesperson. Instead of spending $10,000, attracting 1000 visitors and booking one client, sell better. Set your advertising budget to $4000, attract 400 and sell to 40 of them. To give you an idea where your booking ratios should be, I book 97% of the brides I meet. That is because I did the research, my targeting is accurate, my packages were built for my couples. The couples know my work, so why wouldn’t they hire me to document their special day? The only reason would be that we are not a good fit, but that is the subject of another article. While you are transitioning to the more lucrative segments, do not service a bride on a low budget the same as a luxury client. It does not make business sense. Spend the time and efforts proportionally to the budgets of the two brides. If you spend 40 hours on a $4,000 marriage, spend only 20 on a $2,000 one. Who did your logo? Does you portfolio look like you always shot cheap marriages? Change that! Organize a styled shoot, even if you have to pay for it…Advertise in high-end magazine using the images from the styled shoot. The bride who pays $3000 for your services will respect you as an artist, while the bride who has only a $1,500 budget will not. The second bride will not give you the time to create good work and over time you will suffer. Here is the test: there are two photography courses. You bought one for $1,000 and the second one, with exactly the same content is free on YouTube. Which one do you watch first? Stop discounting your work. Instead of giving discounts, offer more time, if you have to. Ritzy brands do not discount. If you asked Apple to discount their new iPhone, you will be laughed out of the store…High-end brands do not offer discounts. If they cannot afford your services, they are not your clients. As a reference point, here is por price list. How many bookings per year do you need to be profitable? If every couple you meet books you, you are too affordable or there is something wrong with your targeting. Being more selective will help you in the long run as you will gradually get referrals from clients with bigger budgets…Life will be good. To summarize, the Toronto is a very competitive market when it comes to photography, but if you do the work and focus, you can be very successful.